Each winner, selected by random.org, had their e-mail addresses sent to M80 who will distribute the coupons. Please check spam boxes if you don't receive them within a day. There is an expiration date so please watch for that so you don't lose out! I'm so excited as I've seen these giveaways on other blogs and jumped at the chance to work with M80 on behalf of Old Navy for this amazing giveaway where TEN winners will receive a coupon for $50 towards a $100 purchase or more. This is a fantastic deal! Where else is it so easy to get $50 in free clothes and accessories for anyone on your family? Every week, Old Navy Weely features one of their specials and the item of the week for 2/12 - 2/18 is the Women’s Women’s ruffle V-Neck tops. A great bargain at $8 (Reg. $16.50) but you have to hurry as they will only be at this price from 2/12 - 2/18! Need to give your wardrobe a flirty flair that’s easy to wear? You won't go wrong with this women’s ruffle V-Neck top. 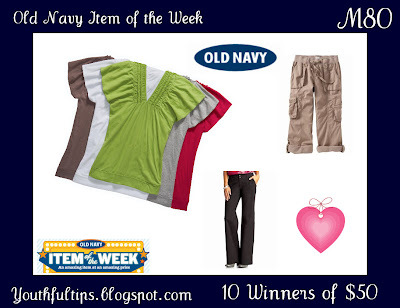 The latest Old Navy Item of the Week will leave you sizzling hot for Valentine's Day or any other day. With easy, essential colors that go with anything, you will be a hit wherever you go. 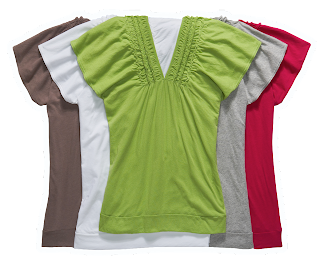 Have fun with the Women’s ruffle V-Neck top and while your at it, choose a great pair of slacks! 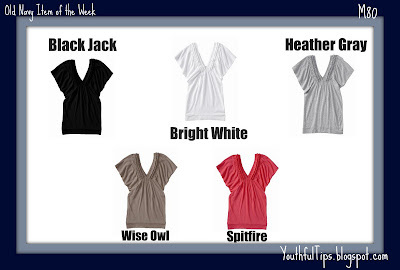 Follow my blog and let me know where you plan to wear your ruffle V-neck. Enter any of my other ongoing giveaways. Giveaway ends: 2/14 so hurry! Thanks to all those who enter! The winners will be receiving their coupon via e-mail in a PDF format. The winners will need to print off their specific code they receive via e-mail and have a certain timeframe to redeem it. All the specifics will be disclosed in the e-mail sent by M80 on behalf of Old Navy. Coupons are valid for a limited time only. Old Navy and M80 cannot replace a coupon that was not redeemed in the correct timeframe. If winner fails to respond within the timeframe the coupon is to be redeemed, an alternate winner. These are only one-time use coupons. Once redeemed, code is no longer valid and cannot be used again. The individual code should not be shared with nor used by multiple users. If a Sales Associate advises that code is not working, customer should ask them to key in the alpha-numeric code under the barcode (if the code is valid, and it’s just a question of the barcode reader having issue with the print quality of the code, then keying in should work – unless it’s already been redeemed then it will come up as invalid). oh well I would wear my ruffle v neck on my body lol... ok so that looks like a shirt I would wear all over the place from going shopping, out to dinner and to bring kids to school. I follow you. I would love to wear this on vacation this summer! I follow your blog (Keonte' Smith). I would wear the top to a dinner date with my guy. The ruffles are flirty and would look great paired with a few, dazzling accessories. I would wear this top on a girls night with a great pair of jeans, some killer heels, and some accessories. I'll be heading to Disney in March so that's where I'll be wearing my ruffled V-neck. Totally missed the 5 extra entries note. I plan to where mine when I go out of town to Florida Feb 19th. I'd love to wear it to my kids' playdates to be the best dressed mom there! I follow too. I also entered the YouthfulTips Bravado! Nursing Bra Giveaway. 2 I also entered the YouthfulTips Bravado! Nursing Bra Giveaway. 3 I also entered the YouthfulTips Bravado! Nursing Bra Giveaway. 4 I also entered the YouthfulTips Bravado! Nursing Bra Giveaway. 5 I also entered the YouthfulTips Bravado! Nursing Bra Giveaway. I follow your blog and think this would be a great top to wear on the boardwalk at the beach!